Wendy: For those not familiar, tell us about Broadside® and Greenside®? Jeff Bacon: Wikipedia says this about Broadside®: Broadside® is a weekly, single-panel comic published in theNavy Times since 1986, and written by Jeff Bacon. 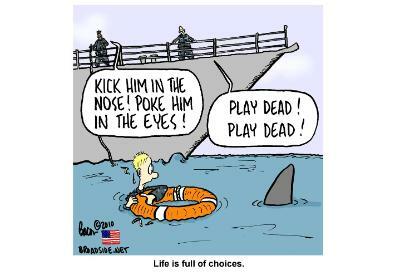 The humor is very specifically directed at United States Navypersonnel, and considered nearly incomprehensible by many non-Navy servicepersons. Bacon also writes a second cartoon called Greenside®, featuring United States Marine Corps personnel stationed aboard Navy vessels. That pretty much sums it up. Wendy: You have participated in several USO tours, wounded warrior and ship visits. Would you tell us about that experience? Jeff Bacon: In 2005 the National Cartoonists Society decided to reconnect with its roots and send teams of cartoonists out to visit wounded troops and in combat zones. The organization itself was created after WWII when cartoonists were asked to do the same thing. The artists realized they liked their fellow travelers and decided to start a club. Since then, cartoonists have visited the troops during all major conflicts, including the Korean War and Vietnam. This was our chance to give back. Since 2005, well over a hundred cartoonists have participated, and the USO now lists cartoonists as one of their most popular “celebrity” tours. The experience meeting young men and women in military hospitals led to the creation of the Wyakin Warrior Foundation (www.wyakin.org), a nonprofit that enables severely wounded and injured veterans achieve personal and professional success as business and community leaders. The program has grown each year and boasts extremely high graduation and employment rates among its alumni. And it all started with the visits to the troops. Wendy: How do you come up with ideas for Broadside®? Jeff Bacon: There is so much going on in the military that I only need to let my mind wander over a few topics or warfare communities and a joke or two pop into my head. To stay fresh, I try to interact with the Navy and Marine Corps to see what is new – and maybe hear a few good stories that will make good cartoons. The target audience is comprised of Sailors and Officers working in the bowels of the Pentagon, on the bridge of a ship, or on the front lines. If I think a cartoon will make them laugh, odds are the rest of us will too. Wendy: What kinds of reactions do you receive from followers? Jeff Bacon: The readers have been very gracious in their praise when a cartoon hits the mark, and kind when one misses. The most common comment is along the lines of, “That happened to me!” When you think about it, many of our personal stories are similar – I just have the privilege of putting them on paper. Wendy: Is there a clear fan favorite cartoon panel that you have created? Wendy: How long does it take to typically create a cartoon panel? Jeff Bacon: It takes about three hours to sketch, ink and color a cartoon. Longer if I have to make changes. Wendy: What inspires you and what are some of your favorite cartoon strips? Jeff Bacon: I am inspired by the indomitable spirit and sense of humor of the men and women in uniform. My only goal is to make them laugh every so often. I appreciated the art and comedic timing of Berkeley Breathed (Bloom Country®) and Bill Watterson (Calvin and Hobbes®), and the goofy joy of just about every Far Side® cartoon Gary Larson ever drew. Early on, before I got into cartooning, I read MAD Magazine and comic books – like every other thirteen-year-old in the world. Wendy: Full disclosure, we first met while working together to create some custom cartoons for the Navy’sOperational Stress Control Program. How does laughter relieve stress? Jeff Bacon: We have been told that laughter actually and literally speeds up the healing process. I think there is also a benefit to laughing at what makes you stressed out. For example, if you work on the flight deck and are stressed out about it, a cartoon poking fun at the very thing causing the stress can lighten things up a little. Wendy: Broadside® has been in print for 28 years now. Why do you think it has lasted so long? Jeff Bacon: Because the military is mostly comprised of young men and women, there is an energy that never goes away, so it is pretty easy for me to come up with cartoon ideas. I think the reason it has lasted so long is because the inside humor tends to resonate across all pay grades. We all have known a clueless Ensign, a surly Chief, or a disgruntled Sailor. I try to treat them all with respect, while giving them a gentle poke in the ribs along the way. Wendy: What advice do you have for aspiring cartoonist? Jeff Bacon: The best advice I ever got was from former Chief Petty Officer Hank Ketcham, author of Dennis the Menace®. He told me (in these exact words), “Don’t quit your day job.” He went on to explain that I could stay in uniform and continue drawing cartoons; in the process I could get experience and exposure. After I retired, I could then pursue the career while being supported by a military pension. I did just that. Cartooning is a very competitive and tough business to enter, and even tougher to be successful. I would recommend having a safety net as you pursue your cartooning dreams. Jeff Bacon is a retired Navy Captain who lives with his wife and daughter in Idaho. He is also a board member and president of the Wyakin Warrior Foundation.